While risotto is originally from North Italy, it is today a staple in all Italian homes. The recipe reflects the fresh and natural flavors of my hometown – the sun-kissed coastal region of Puglia in Southern Italy bordering the Adriatic sea. Here, pasta and risotto paired with fresh-caught seafood is a must, thus inspiring this recipe. Chop the fennel, celery, ripe tomatoes, carrot, onion and garlic. Add all the chopped vegetables, sea bass bones, lobster shell and prawn shells into the saucepan, and bring to a boil until the stock is reduced to half. Strain the liquid and keep aside for cooking the risotto. In a pot, lightly fry the onion with olive oil until golden brown. Add the rice, and cook for two minutes. Now add half of the white wine, making sure all the liquid vaporizes. Once all the wine has evaporated in roughly 2 minutes, add the hot brodetto stock one ladle at a time. Leave to cook for 12 minutes. Cut the lobster, sea bass, scallop and tiger prawns into cubes. Sauté with garlic, the remaining half of the white wine, lemon zest and a pinch of fennel seed powder. 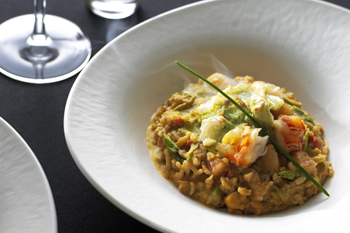 When the risotto is almost ready, add the cut seafood to the risotto and cook for another 3 minutes. Add fresh herbs, extra virgin olive oil and season to taste. Using lobster bisque instead of the Brodetto stock can enhance the flavor of the seafood. A glass of Pinot Grigio would be the best white wine to pair with this dish. Adding a pinch of saffron will create a new dimension to this recipe.